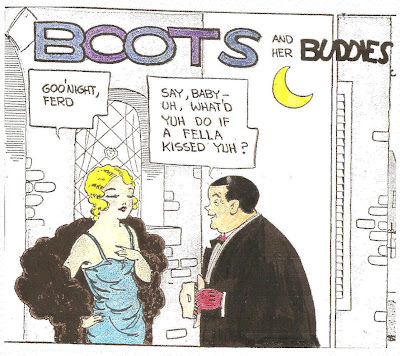 Boot and her boyfriend, Ferd, from the "Boots and her Buddies" comic strip from April 12, 1929. 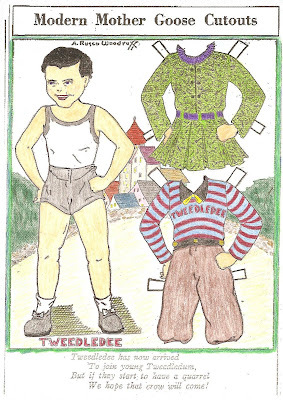 I enjoyed seeing the "Ferd" paper dolls that Marge posted on her blog. 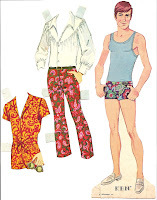 An odd but interesting Boots paper doll. 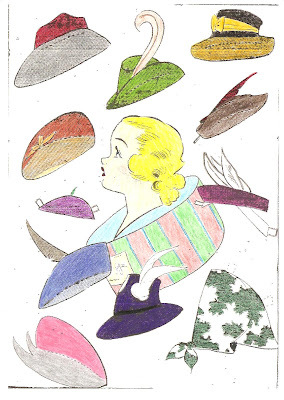 Boots and her hats appeared in the Sunday comics of October 09, 1938. 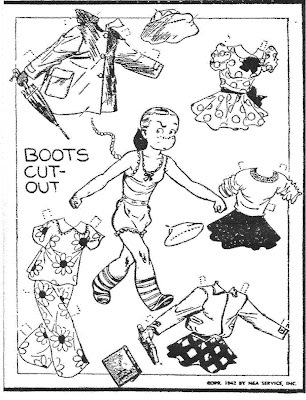 This Boots paper doll is from the Sunday comics of September 18, 1938. Somebody's Stenog was a comic strip that ran from 1918 through 1941. Before World War I most stenographers were men. Because of the manpower shortage created by the war, women had to take over the work typically performed by men. One such woman was Cam O'Flage, the heroine of Somebody's Stenog. Cam was pretty and smart, and worked as a girl Friday in a nut-and-bolt factory. 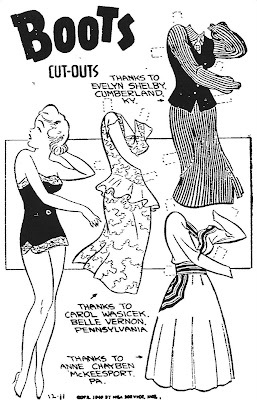 This newspaper paper doll of Cam is from the Sunday comics of September 03, 1933. 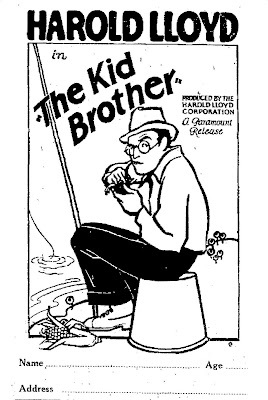 Children, 12-years of age and younger, could enter the newspaper coloring contest to win tickets to see Harold Lloyd in the movie "The Kid Brother". 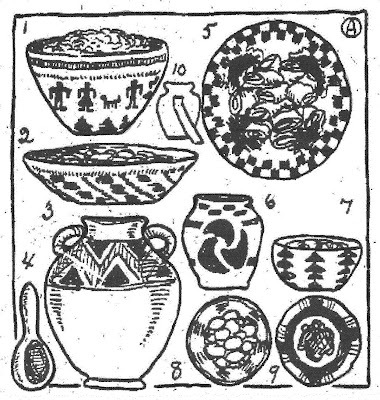 This contest is from February 1927. According to my Leonard Maltin Movie & Video Guide this movie is one of Harold Lloyd's all-time best and received 4 out of 4 stars. 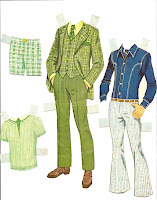 "Polly's Paper Playmates" was a newspaper paper doll series. The series included Polly, her family members and her friends. This is her cousin, Cornelia, and she want to be a movie star. 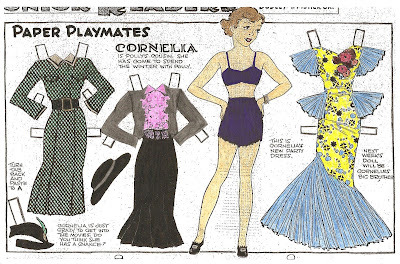 The Cornelia paper doll appeared in this Iowa newspaper on March 28, 1940. 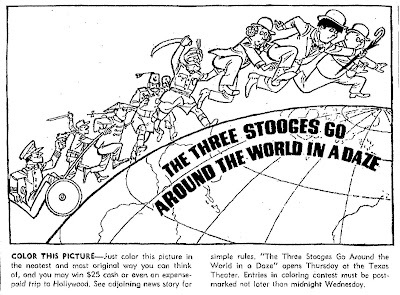 This newspaper coloring contest for "The Three Stooges Go Around The World In A Daze" appeared in various newspapers on September 22, 1963. My brother Bobby and I would eat our breakfast while watching "The Three Stooges" on television every morning before our long trek to Harvard Elementary School - which was one block from our house. I still like the Three Stooges. I do not remember ever seeing this movie. 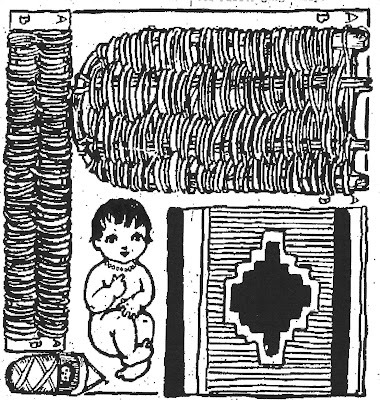 CUT-OUTS FOR CHILDREN appeared in the Sunday Washington Post newspaper from 1909 through 1910. 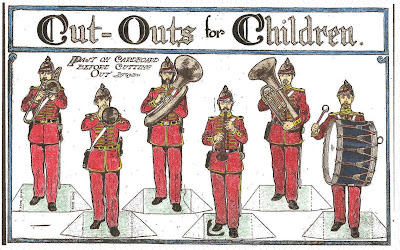 This Marching Band Cut-Out is from August 01, 1909. Bobby played the tuba in the Reagan High School Marching Band in the late 1970's, so pretend the tuba player without the beard is named Bobby. 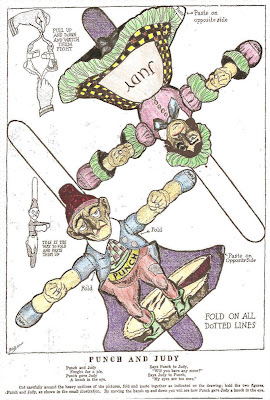 Here is the BOOTS newspaper paper doll from the Sunday comics of December 11, 1949. A young PUG paper doll from the Sunday comics of September 27, 1942. Thanks to Edgar Martin. More Paper Dolls from "The Old Home Town"
Two more paper doll citizens from the comic panel "The Old Home Town" by Lee Stanley. 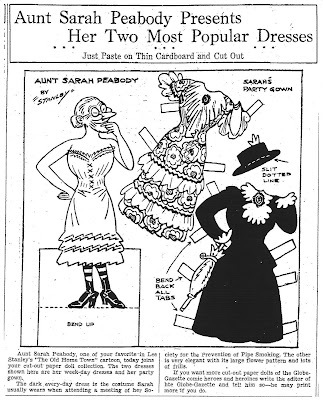 Aunt Sarah Peabody and Marshal Otey Walker appeared as newspaper paper dolls in April of 1935. 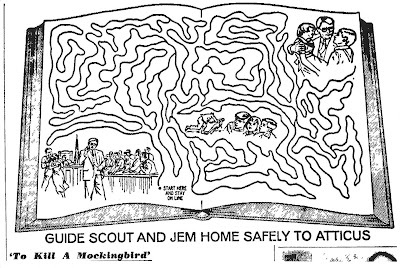 This newspaper coloring/maze contest for "To Kill A Mockingbird" appeared in a Chicago newspaper on March 06, 1963. Children twelve and under were to color the images and solve the maze to win a pair of tickets to see the movie based on the novel by Harper Lee. 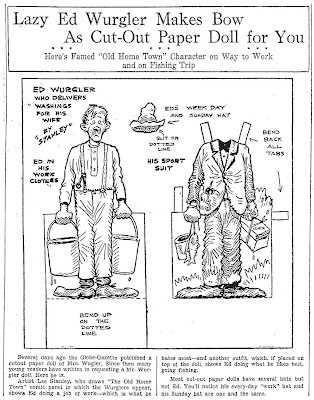 ED WURGLER Paper Doll from "The Old Home Town"
The Ed Wurgler newspaper paper doll from the comic panel "The Old Home Town" by Lee Stanley. 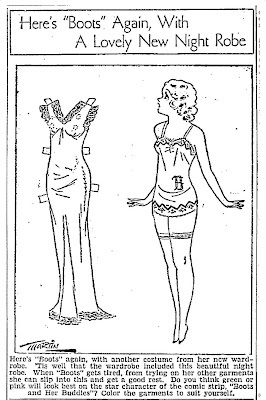 This paper doll was published on May 10, 1935. 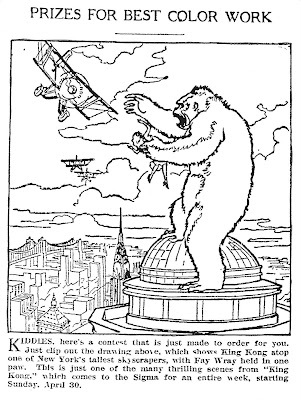 The final three pictures from the series of six in the "KING KONG" coloring contest. All six pictures had to be colored and submitted to win tickets to the 1933 film. 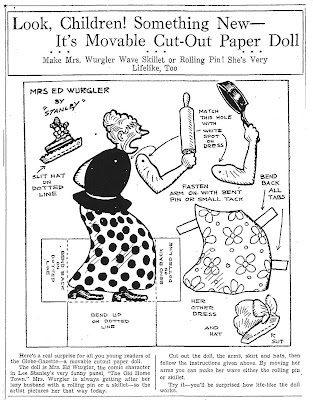 Mrs. Wurgler Paper Doll from "The Old Home Town"
The Mrs. Wurgler paper doll appeared in a weekday newspaper on April 24, 1935. Lee Stanley was the creator of the comic panel "The Old Home Town". Mrs. Wurgler was always chasing after her husband with a frying pan or rolling pin. Mr. Wurgler will be posted tomorrow. 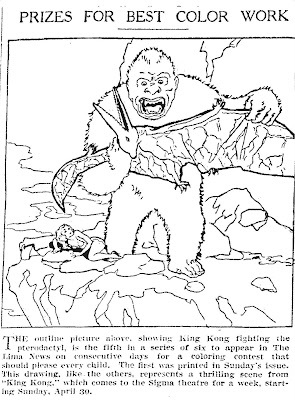 This famous scene was the first in a series of six pictures from a coloring contest promoting the movie "King Kong". It appeared in newspapers on April 23, 1933. 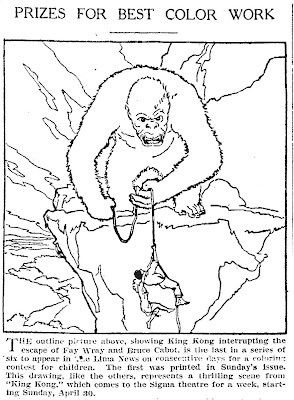 The second in the series of six pictures appeared in newspapers on April 24, 1933. Notice Fay Wray up in the tree. 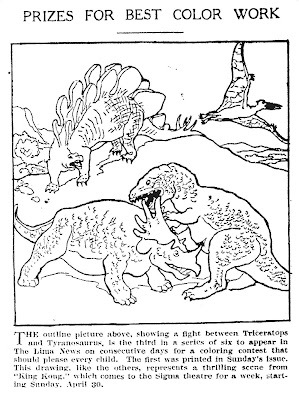 The third picture in a series of six appeared on April 25, 1933. The classic movie "King Kong" was directed by Merian C. Cooper and starred Fay Wray, Robert Armstrong and Bruce Cabot. The final three pictures will be posted tomorrow. 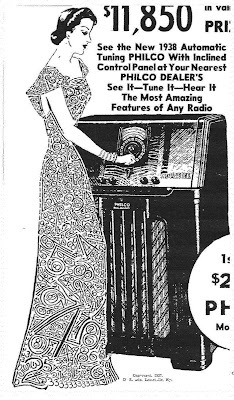 This newspaper contest was to promote the New 1938 Automatic Tuning PHILCO Radio. 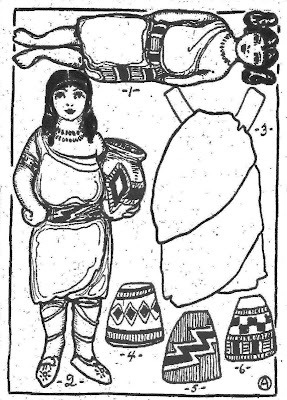 The dress worn by the lady in the above picture was composed entirely of numerals. 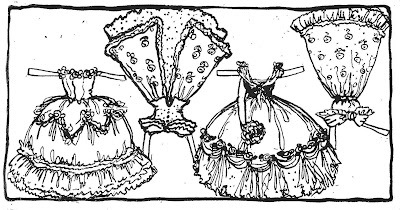 The contest was to add together all the numerals in her dress - numbers 1 to 9 - and submit the total. I used to have a clothes line and I loved the smell of clothes that had been dried by the sun. This BOOTS paper doll is from the Sunday comics of April 05, 1953. I thought that Pug was sister to Boots but I now know that Pug was "adopted" into the family. Here is Pug in her bedroom. 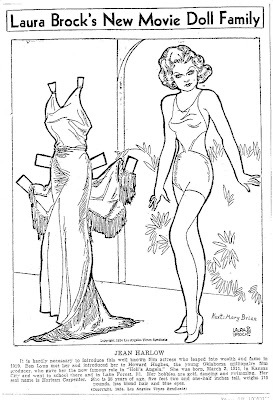 This paper doll is from the Sunday comics of November 04, 1951. BOOTS once again pleased with what she sees as she looks into her vanity table mirror. 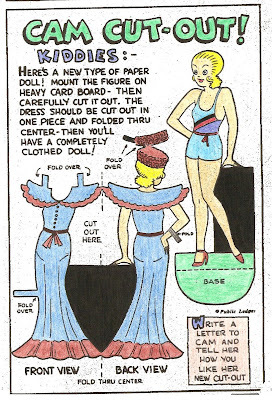 This paper doll is from the Sunday comics of February 10, 1952. Many thanks to Edgar Martin. 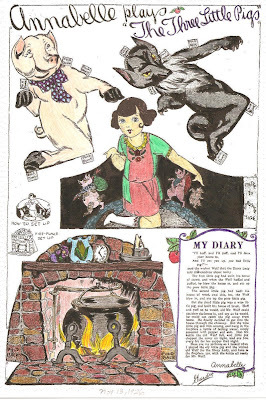 A wonderful newspaper coloring contest promoting the movie "Irene" starring Colleen Moore. 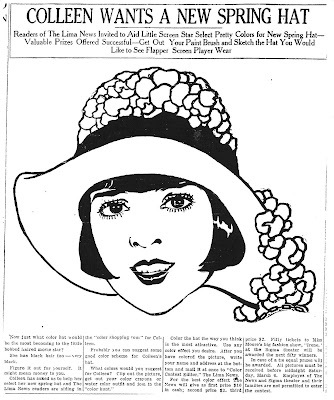 This contest appeared in newspapers on March 02, 1926. 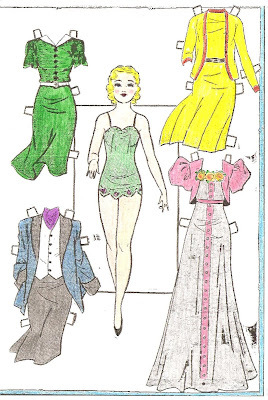 The beautiful Jean Harlow as a paper doll from the Laura Brock Movie Star Paper Doll series. 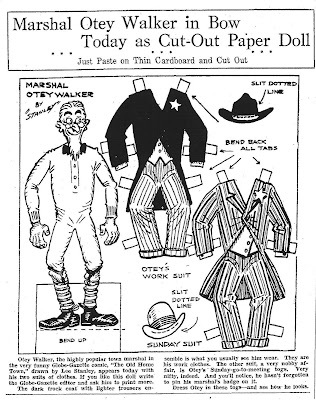 This newspaper paper doll is from May 27, 1934. 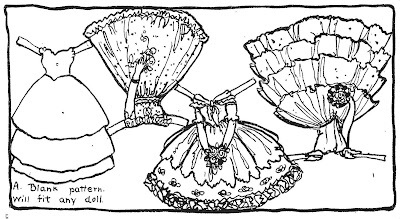 These newspaper paper dolls are from "Merry Makings by Aunt Elsie" section of the Sunday Oakland newspaper of August 22, 1920. If Lily had been named Daisy they could have been the sisters from my favorite British comedy "Keeping Up Appearances". 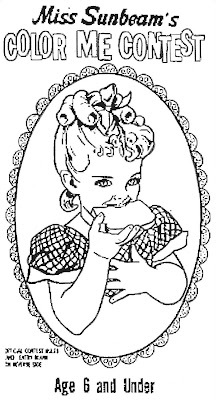 A newspaper coloring contest conducted by Sunbeam Bread featuring Little Miss Sunbeam. The contest was open to children 6 years of age and under. I enjoy searching through newspaper archives and finding fun items such as this "Count the Dots" contest. 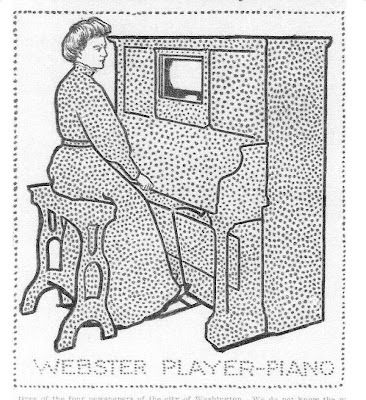 This newspaper offered a Webster Player Piano as the prize in their count the dots contest. I have come across many different versions of these contests, most appearing in the early 1900's. This one is from October 1909 - almost 100 years ago. 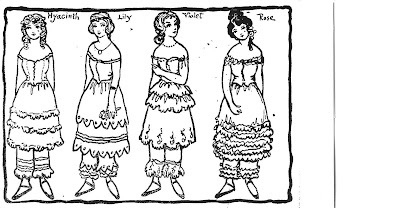 What a great newspaper paper doll series this was for little girls in the mid-1920's. I have never seen an original Annabelle paper doll from this series. I colored it to the best of my ability - which is quite limited. "ANNABELLE Plays The Three Little Pigs" appeared in the Sunday comics section of various newspapers on November 13, 1926. 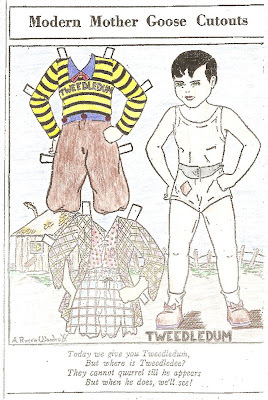 Tweedledee and Tweedledum are newspaper paper dolls from 1938. 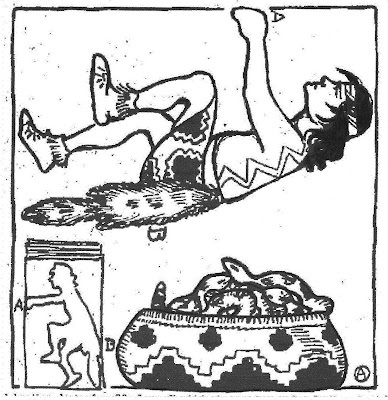 They are from the Modern Mother Goose series by Addie Roscoe Woodruff. HERBIE joins the mad race in Walt Disney Production " The Love Bug". The script for the screw-ball racing picture was written by producer Bill Walsh and Don DaGradi. The movie was released in 1969 and starred Dean Jones, Michelle Lee, Buddy Hackett and David Tomlison. 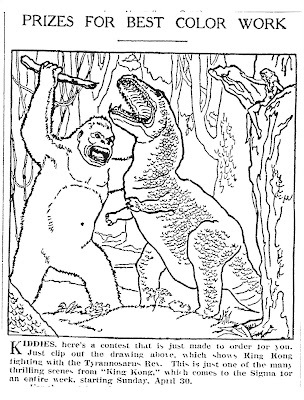 This newspaper coloring contest appeared on July 01, 1969. 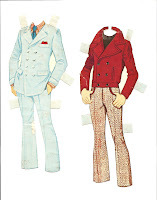 Another piece of my childhood - my KEN Paper Doll from 1970. I remember my brother Donnie had a pair of red, white and blue flare jeans. 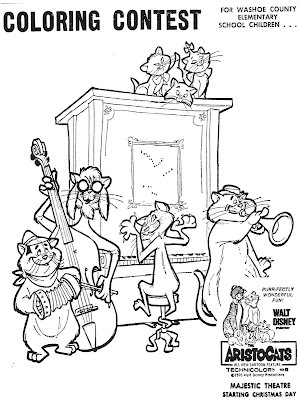 "The Aristocats" was a Walt Disney Production released on Christmas Day 1970. This animated movie featured the voices of Eva Gabor, Phil Harris, Sterling Holloway, Scatman Crothers and many more. 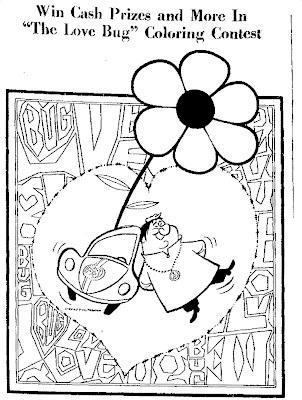 This newspaper coloring contest appeared on December 15, 1970. 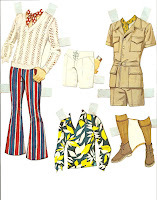 "The Barefoot Executive" was released by Walt Disney Productions in 1971. The movie starred Kurt Russell, Joe Flynn, Harry Morgan, Wally Cox and Heather North. 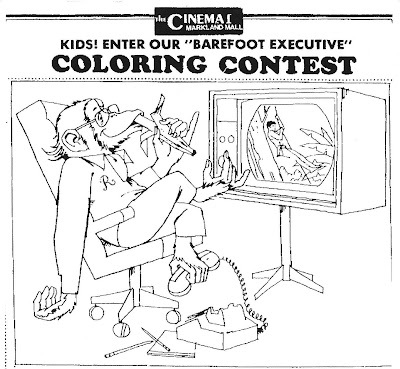 This newspaper coloring contest appeared on April 01, 1971. "Horace" from the Sunday comics of July 17, 1938. He was once a beau of Boots, but Horace eventually married Babe. 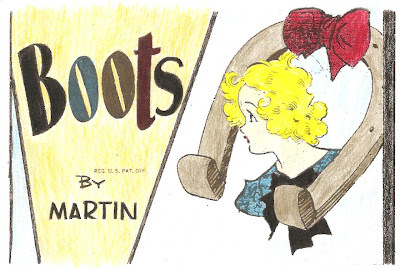 "Boots" from the Sunday comics of April 22, 1951. Thanks to Edgar Martin. 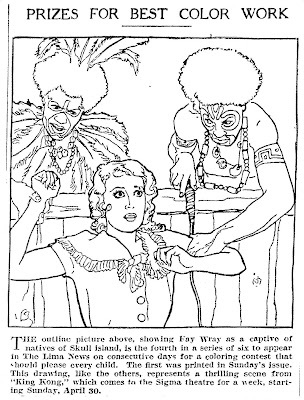 This newspaper cut-out of "Punch and Judy" appeared in some Sunday comics on March 31, 1928. I have never understood the popularity of Punch and Judy. 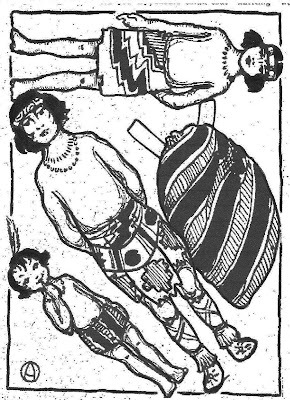 In August of 1922 "Aunt Elsie" ran a series on Hopi indians. The series was about the every day life and customs of the Hopi people - it was very informative and respectful.